During this year’s Electronic Entertainment Expo (E3), YouTube attracted a big audience with a live stream that pulled in eight million views in its first 12 hours of coverage. Not to be outdone, Twitch is also boasting its own big E3 numbers. 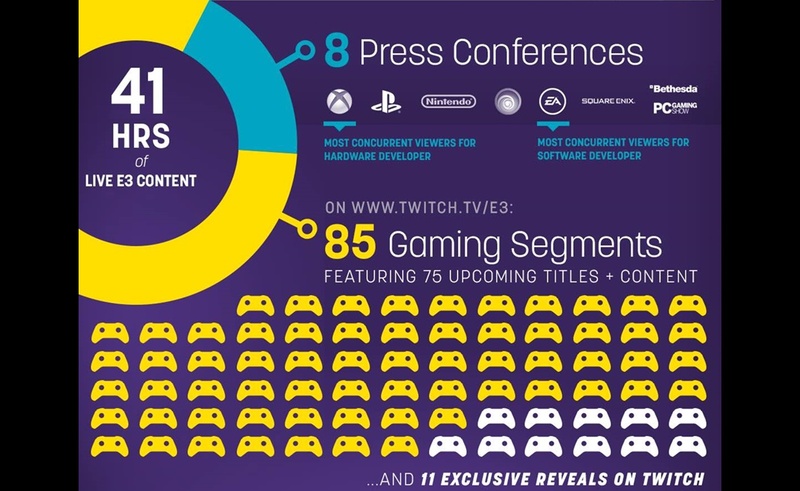 The live streaming site dedicated to video game content shared an infographic breaking down the nearly 12 million hours of watch time its E3-related streams received. The 11.98 million hours of watch time came from more than 21 million unique viewers. At peak viewership, 840,000 people concurrently streamed E3 content, and as Twitch notes, that number was 16 times the number of physical attendees at the video game industry’s biggest yearly event. Twitch managed to deliver a large amount of E3 coverage thanks to its status as the event’s official live streaming partner. At the same time, the site’s decision to let its users co-stream E3 coverage also turned out to be a smart decision. Co-streamed footage made up 35% of Twitch’s total E3 viewership, with 1,801 channels participating in the program. Co-streaming was particularly popular for international audiences, as it was used to deliver foreign language versions of the E3 stream.